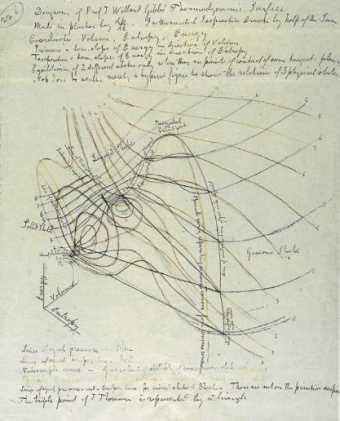 Diagram of Maxwell's thermodynamic surface, with "isothermals and isopiestics drawn by help of the Sun. ", 8 July 1875. See James Clerk Maxwell and P. M. Harman (2002), The Scientific Letters and Papers of James Clerk Maxwell, Volume 3; 1874-1879, p. 232. The relationship between magnetic and electrical fields provides the foundational theory of electrical engineering. While naturally occurring electrical phenomenon such as lightning, static electricity and the shocks of various fishes and eels have been observed in the ancient world, the formal study and understanding of electric phenomenon began with William Gilbert's work on magnetism, culminating in his 1600 paper "On the Lodestone; Magnetic Bodies; and the Great Magnet, the Earth". Benjamin Franklin's many significant discoveries and Luigi Galvani's discovery of bioelectricity would follow in the 1700s, and in the early 1800s André-Marie Ampère and Hans Christian Ørsted discovered the link between electricity and magnetism, which were formalized by Maxwell's laws in 1873. These laws form the mathematical basis for practically the entire field of electrical engineering and its developments. The pure fields and waves aspects are still very commonly used today in applications such as antennas, microwaves and radio astronomy. The IEEE Antennas and Propagation Society, IEEE Electromagnetic Compatibility Society, IEEE Magnetics Society, IEEE Microwave Theory and Techniques Society publish technical journals related to electromagnetic fields and waves. Pages in category "Fields, waves & electromagnetics"
Archives:But What's the Use of It, Mr. Faraday? Media in category "Fields, waves & electromagnetics"